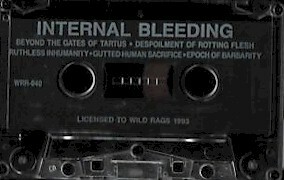 After the breakup of his original band Autumn Reign, guitarist Chris Pervelis went on to found the first INTERNAL BLEEDING lineup in early 1991. That winter, a case of 300 blank tapes were "found" at a local university and provided the inspiration to set up a 4-track recorder and record the One Dollar Demo. 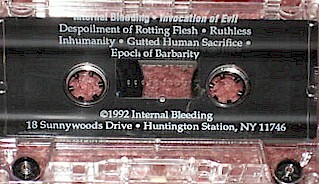 Shortly after that recording, INTERNAL BLEEDING started playing shows and managed to sell out of all of their tapes. 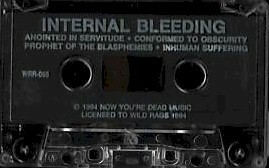 In the winter of 1992, INTERNAL BLEEDING released their now classic Invocation of Evil demo, which went on to sell an impressive 5,000 copies through the now defunct Wild Rags Records. Soon, pressure started to come from Wild Rags, fans, and the band themselves, and INTERNAL BLEEDING returned to the studio to record another demo in early 1994. The band immediately hit the road with a vengeance, promoting themselves and their music shamelessly. All that self-promotion and tireless dedication was to bear fruit at that year's Milwaukee Metalfest, where the band's captivating performance caught the eyes and ears of Pavement Music. They signed with Pavement and in 1995 released their debut album, Voracious Contempt. Xeroxed four panel covers. Regular Tapes. Sold for a buck. Original pressing of 600 cassettes made by the band contained pro-three panel cover on heavy cardstock. Lyrics and band photo on other side. Pro printed tapes. Sold out in about a month, then it was released on a mini-cd format and cassette format through Wild Rags. Wild Rags version of the cover is the same as the bands. Recorded on regular tapes. Xeroxed three panel covers. No lyrics. This is the bands version. Wild Rags Version. Considered a EP by the label. Pro printed covers and cassettes.